Highest Certified by CGC! The best that Timely had to offer made up the cast of this comic: the Human Torch, Captain America, the Sub-Mariner, the Angel, and the Black Marvel are here. They star in separate features, but a text story by youngster Stan Lee has the first appearance of the All-Winners Squad, which had Timely's top stars teaming up! That supergroup wouldn't appear in comic panels until #19. So there are winners aplenty on hand, and the guys drawing them weren't exactly a bunch of nobodies: Simon and Kirby contributed, as did Carl Burgos, Bill Everett, and cover artist Alex Schomburg. 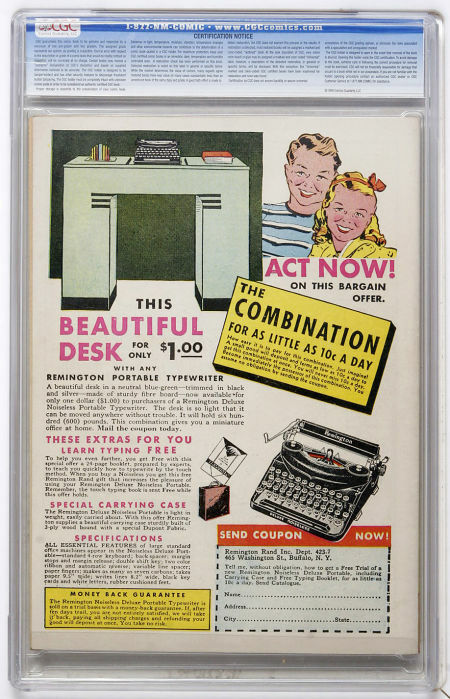 With so many points of collector interest, it's no wonder the issue is listed among the most valuable Golden Age comic books in Overstreet's Comic Book Price Guide. 2008 Overstreet Price Guide value for NM- 9.2 is $40,000. 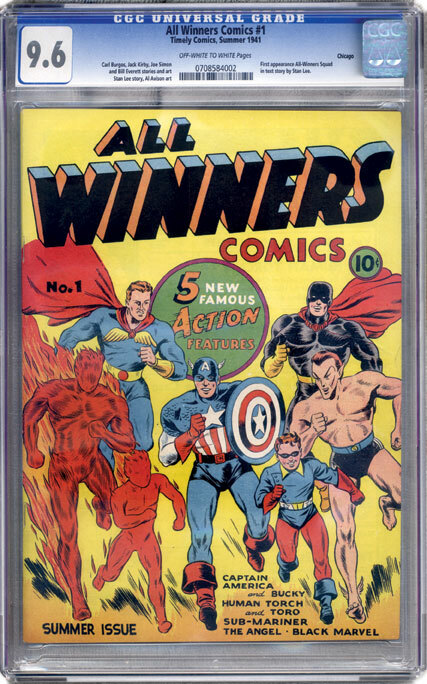 Certified NM+ 9.6 comics from Pedigreed collections, such as this, generally sell for multiples of the 9.2 Guide value.